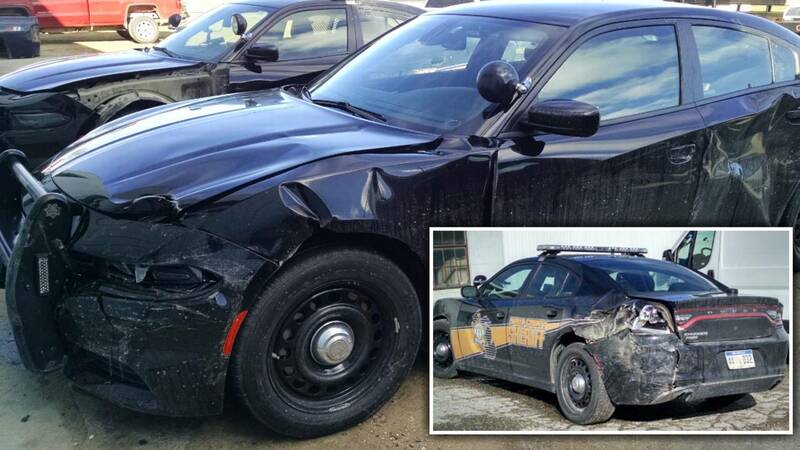 LAPEER COUNTY, Mich. - Two Lapeer County sheriff’s cruisers were damaged in separate collisions Wednesday morning while deputies responded to crashes on icy roads. Deputies responded to calls about multiple semitrucks and vehicles that went off the road on eastbound I-69 near Lake Nepressing Road in Elba Township. Deputies said they used cruisers with emergency lights activated and warning flares on the road while they investigated just after 1 a.m. The deputies were at the scene for several minutes before a 39-year-old Ferndale woman lost control of her vehicle and hit a patrol cruiser from behind. The woman was issued a citation for the crash. Neither the woman nor her 19-year-old passenger were injured. The freeway was closed for several hours while emergency crews worked to remove vehicles from the median and shoulder. Another patrol cruiser was struck just before 7 a.m. while a deputy was responding to a crash near the intersection on Lake Pleasant and Lum Road in Arcadia Township. Michigan State Police are investigating the crash. No serious injuries were reported, but the deputy who was in the cruiser sought medical attention as a precaution. Authorities are using the crashes to highlight the importance of driving with caution when roads are icy or snowy. Drivers are also reminded to slow down and, if possible, move over a lane when they see an emergency vehicle on the side of the road.